@Horton, you comment about consistency with the buckles of the boot. One thing that works is to paint a line in the grooves on the strap so that you have a reference point as to where it should go into the buckle. @ToddL Things like water temp, whether the liner is water soaked or several other factors can change the feel. Control the variables (dip the liners in the water before you ski). Tighten the clips to feel right. If you can't feel what's right, following a mark on the clip blindly can be counter productive. In my experience with the Reflex system, it is very temperature sensitive on release settings (as well as binding variability). My boots softened with heat and would release much easier in hot water. Dual lock is pretty temperature sensitive too. And my Gatorade lids get brittle and release too easily when it's cold. Just a random observation. @Cayman2 My experience was that I had a hard time keeping the dual locked binding on the ski in my extremely warm water. Also it was easier to damage the dual lock resetting it in the heat. But my water and lake gets VERY hot at times. But many people have successfully used dual lock and Reflex in my heat - I just struggled with those systems. @Horton have you tried 38 on the Reflex yet? I was curios if you thought the bindings make a difference at your hardest line lengths. It seems like you are comfortable enough on the Reflex to test a new ski and be sure that the bindings aren't impacting the test. One question...why wouldn't you heat mold the liners? @Jordan after a few sets in heat moldable liners, they mold to your feet just through skiing. @Ilivetoski They kinda shape to your feet just through skiing, but nothing like they do if they are heat molded. Particularly for the Reflex thin, not so much for the thick. @Horton But aren't the thin liners supposed to be molded? They come out of the box flat, no shape at all except for the tongue. Kinda like Toll House cookie dough. Very tasty stock out of the package as is but so much better cooked as they are meant to be. I agree with painting the buckles. I also agree that depending on how the liner is soaked/fitted to your foot, it can change the feel of the boot if you go to the same place every time. That said, I paint my buckles (whiteout pens works great) but it's basically a close approximation. I might be a click tighter or looser than the painted line depending on how it feels but it gets me where I need to be quickly and easily. I usually go to the designated spot and if it's too tight, I'll back it off one. 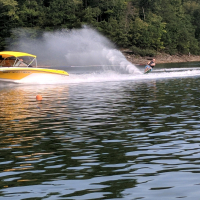 If it feels loose on the boat but after a pass or two, my foot hurts, I'll back it off a click. @horton. Did you set your front binding with the. "Ankle bone" variance per your earlier thread?? I switched from Fluid Motions to Reflex width the R-Style rear last October. 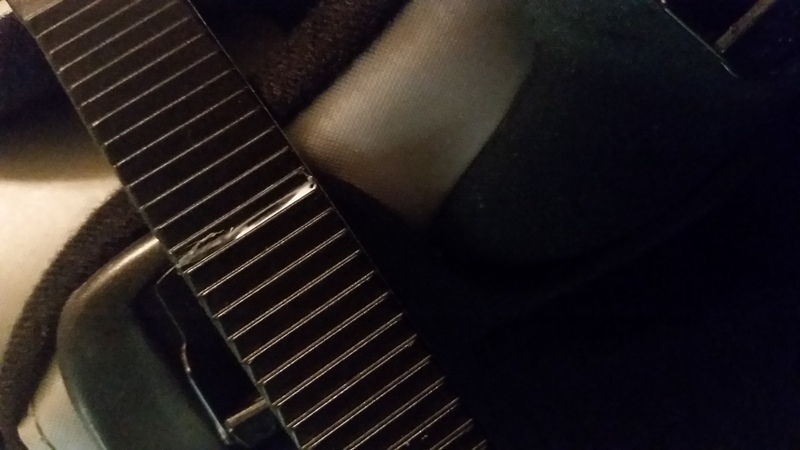 Yesterday I had my first OTF fall that tested the Reflex release mechanism. It was a very smooth release. The front popped and then my rear foot slipped out. We even had some poor video of the crash (still working on getting video set up correctly). Looking at the video and personal experience of the OTF release, I am a very happy customer. With the Fluid Motions the rear pin would release first and then you would feel the Velcro slowly peel off. The Reflex release was instant. Not to thread hijack, but the video also showed that I let go of the handle during the fall at the ball, overtook the handle. As I was hitting the water my hand was pushing down into the triangle of the handle. I use a handle guard and if it was not there I probably would be done skiing this season from a arm or shoulder injury. I'm really envious now... Not so much for thr Reflex binding (that too, though), but for the mirror like water throughout Horton's video! I rarely see water that glassy on the public lake where I normally ski, even when I am there at 5am!